*Exclusive Extra Bonus Value! 10 Year Nationwide Extended Warranty: Repair Parts & Labor , Power Surg, Transfer Owner, No Lemon, Replace, Buyout % Depreciation, for Non Commercial Use in the USA. The new Pro-Series™ by Royal® introduces the CleanSeeker upright model. 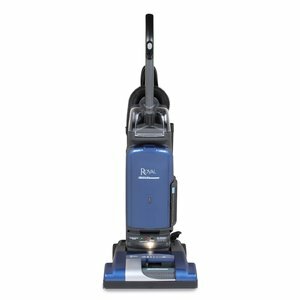 The UR30085 Upright vacuum cleaner comes loaded with features to provide commercial cleaning customers ease of use and durability. Other features include: 12.0 AMP Metal Motor. 15" inch Wide Cleaning Path. A Full Set of On-Board Cleaning Tools, including; 8 ft.Stretch Hose, 2 Extension Wands, Crevice Tool, Upholstery Tool, and a Dusting Brush. Built-in Headlight for turning down the lights and doing some romantic vacuuming. Fingertip On/off Switch. Furniture Guard. 29 ft. Electrical Cord. 3 Year Parts and Labor Warranty. Ready-to-use 8' stretch hose with on-board tools for above floor cleaning. On-Board tools include 2 extension wands, crevice tool, upholstery tool and dusting brush.